Trying to match an HOA mandated color from the Home Depot titled Tugboat. It is a medium brown with a touch of green. Any thoughts? I'd love to purchase a high quality stain such as yours. Sorry but no. AC cannot be color matched and we do not have a brown with a green tint. We purchased four samples and then placed our order in last month. We did not receive a credit on any samples. Can you credit our charge card? We used rustic brown on 5 year old cedar previously stained with the Armstrong Clark transparent. The previous coat only lasted two years. We are hoping rustic brown keeps the grey away longer. The greying is really only dirt which power washes off. Max credit is $15 and we issued that today for you. Thanks! This is the deck right after a rain.Its been stripped and washed. Do you have anything that I can use to create the same look (without it raining)? Look at Natural Tone or Cedar Tone. I'd like to get as close to possible to black for a PT deck skirt/apron. Would the semi-solid black walnut get me there? Would I need at least 2 coats? Thanks! It would be the closest but it is not a straight "black" color. Color will also vary based on the age of the wood. How many coats varies on the age as well. We want to stain our redwood deck with AC semi-transparent. How would you mix your Sierra Redwood color to be less red. My neighbor did his deck with it and its too red for what we are looking for. 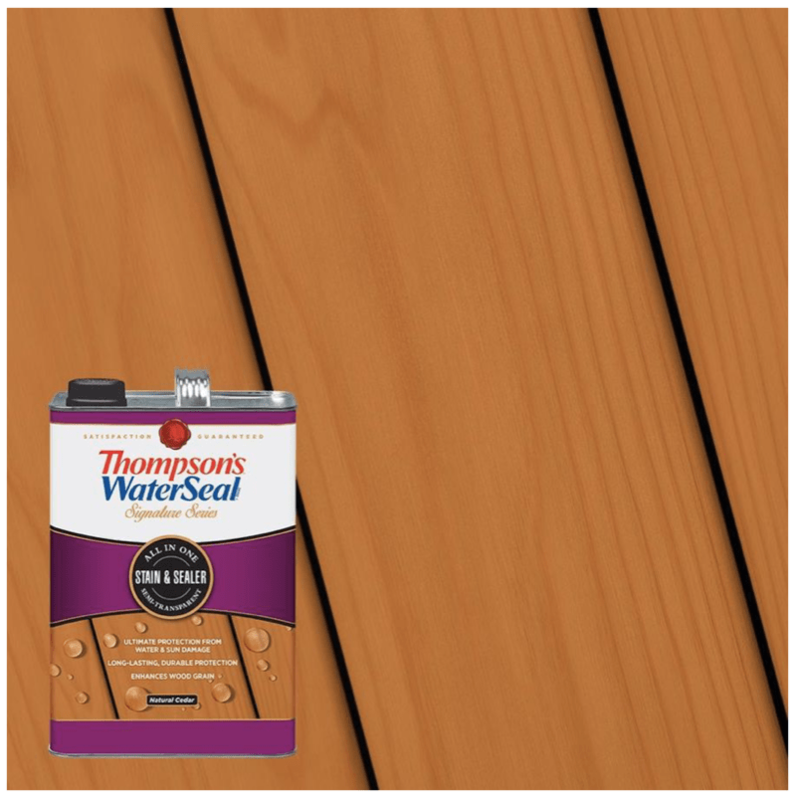 Looking for more of the Redwood Tone (shown in transparent color) look, but we want pigment for UV protection. Also, just to make sure, the Hardwood/IPE colors are Semi-Transparent right? Not Semi-solid or Clear? You cannot lessen the tone of the SR and still have the semi-transparent UV protection. If you tone it down to the color of the Transparent Redwood, you will have the UV protection of the Transparent Redwood. The Hardwood color can be used on all wood types but have the UV protection of a semi-transparent. So the Hardwood/IPE Transparent stains have the same (or more?) UV protection but less pigment than the Semi-Transparents? And do the Transparents for Hardwood/IPE have the same water and mildew protection? No. They are semi-transparent in color and pigment. You are reading more into this then there is. Oh. Hardwood Transparent = Semi-Transparent. Got it. I should have known that. I have a new cedar deck that I will stain in Sept after 3 months of weathering. It has already greyed, which I like, significantly due to full south exposure. If I apply a clear sealer, is this enough to protect the cedar? Will cedar continue to grey due to the UV light hitting the wood through the sealer indefinitely or will there be a time when the greying eventually stops? Is it best to just use a semi-transparent driftwood stain instead of a clear sealer? I have sienna PT steps running down from the deck to the ground. To keep both the cedar and PT wood consistent in colour, do you agree that it would be best to use a semi-transparent driftwood stain instead of a clear sealer for everything? Also, does the driftwood as shown in your sample section above look that white washed? Armstrong does not come in a Clear. Best to try some samples to test the Driftwood Gray color on your wood. Different wood types will stain slightly different. Will the semi-transparent stains looked different depending on how weathered the cedar is? That is, more weathered and gray will look different than new cedar? Final color always varies based on the wood type and age. The prep will remove the gray on older wood. I have a porch made of pressure treated pine that is about 15 years old. It was previously stained several times with Thompson's Waterseal cedar finish. I have stripped and cleaned the deck part of the porch but I am leaving the railing and pickets as is (see photos). They are still in good condition and would be way to much work to strip. 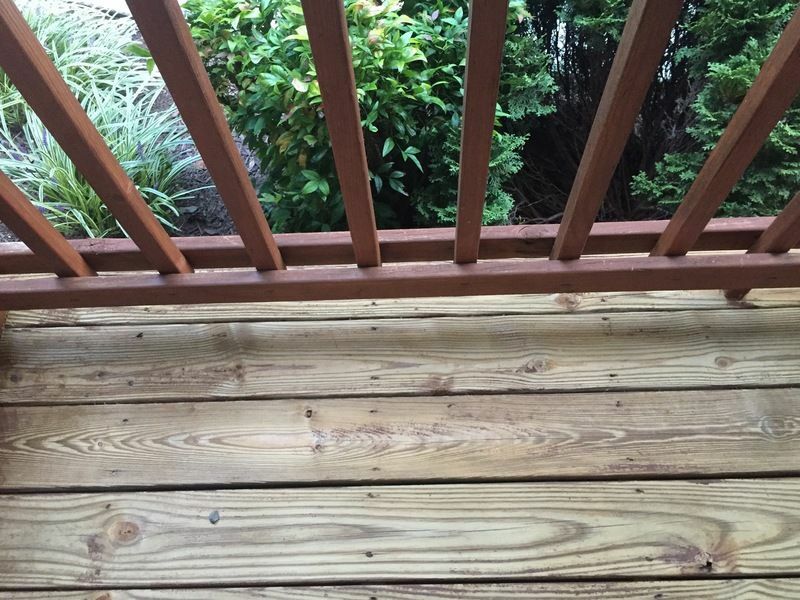 I would like to find a color for the deck that matches fairly closely the rails and pickets. I would like to order some samples but I'm not sure where to even start and with them being $8 each do not want to order more than I need to. I would greatly appreciate any suggestions. Thank you. Look at Rustic Brown and Oxford Brown. Those colors appear very brown. The stain I'm trying to match has a lot of orange in it. So if I order several samples I will only get credit on the 5 gallon purchase for $15 even if I buy 4 samples at $32? Your stain is more brown with a hint of red. It is not orange. You could also look at Sequoia. $15 is the max credit. This is the color I previously used. It really does appear quite orange. what is the most popular/most sold color in the semi-transparent stain? We area looking for color options for IPE, but we haven't built the project yet. So we are wondering can we order some small wood pieces that have been stained in different colors? We sell samples of the stain, not the wood pieces. Where can I buy product in Oregon? We are an online dealer for the AC and can ship this directly to you in 4-5 business days. which of your stain colors do you suggest I sample to get these looks on a clear redwood fence? any retailers local to Los Angeles? Which of your stains best for a clear redwood fence that could get Lots of sun, and on occasion heavy rain? and can I stain right away, or do I need for the wood to weather. If so, for how long? We live in Iowa cold winters, hot sun and humidity, how many years will the semi transparent last before we have to stain it again. We have pine log siding on our house that is 10years old. We powerwashed and bleached it. Now ready to restain. For exterior pine logs, about 3-6 years. Longevity is directly related to UV exposure. All previous coatings must be removed first. For exterior pine logs, about 3-6 years. Longevity is directly related to UV exposure. are custom mixed colors available? We do not custom mix colors. Sorry but no, this will not work for interior wood. I just saw this thread and wanted to ask clarification for my project which is currently unfinished white pine paneling and I want it to match my covered deck ceiling. I hoped that because of it being "non-toxic" and having "low VOC's" that it would be able to be used on interior surfaces...or is it not recommended for my situation either? You can use it on the deck ceiling but it is not suggested for any interior wood that is in the house. I really like the look of the semi solid oxford brown- a new cedar fence installed 6 weeks ago fencing running horizontal. Any concerns with this color south facing and east facing in Denver, CO suburbs. Thanks! No issues with this. It will look great! We have just replaced the top of our dock in Georgia with pressure treated pine. The old top was drained with Armstrong’s driftwood color and was very hot in summer. Are there colors that will protect the dock but be less hot under foot? Lighter tints seem to retain less heat but if in full sun all day, it can still get hot under foot. Is the black walnut stain the same color as the twp 1500 BW? Sorry if this has been asked before (can't find question)....My deck has splinters and cracks and small gouges where wood had splintered. Do you carry a stain that fills cracks? Is shipping free to Canada too? Sorry but no, the AC products are penetrating coatings and cannot fill cracks. Shipping to Canada is not free. I am trying to decide between the rustic brown and chestnut semi trans stain. They look similar. Does the chestnut have a red undertone? Yes, the Chestnut has reddish brown while the Rustic more of a medium brown. We need to stain some new log posts that support the roof above our deck. Can we use your stain for that? 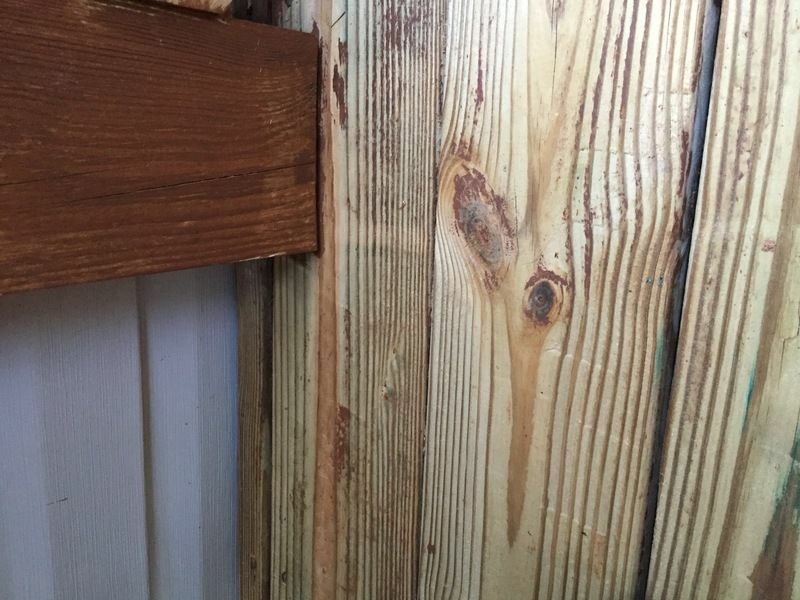 I saw in one of the comments that wood needs to breathe and that you don't recommend completely covering the wood, but we need to find some way to protect the posts from the sun. Yes, you can use the AC for this. The AC is a penetrating breathable wood stain. After the wait and prep, try any color you like. What kind of stain is best to use on a pressure-treated wooden deck? 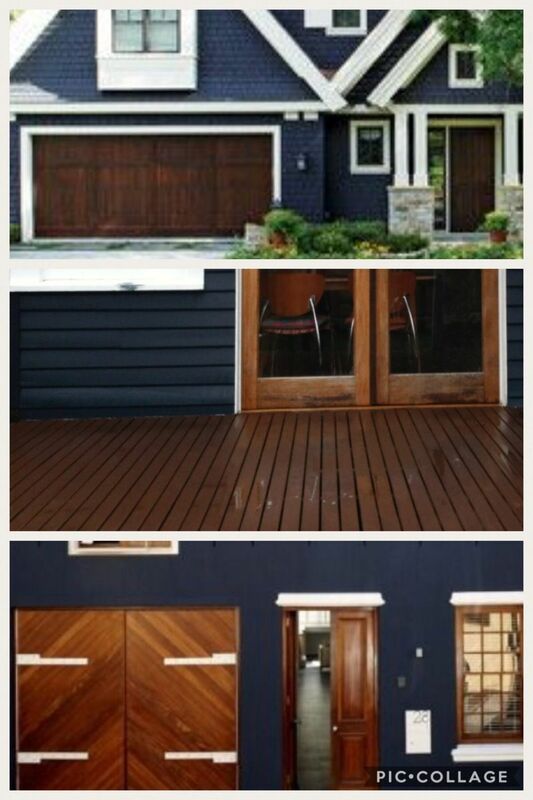 Any of the AC stain colors will work for PTP decking. To stain two pine Adirondack chairs, how much stain should I account for? If I buy too much, what is the shelf life of the stain? Just one gallon. Shelf life is 12 months after opened. We ordered two samples last summer but don’t have the order number and we’re ready to order our stain. Can we still get the cost we paid for the samples deducted from our order and if so how? Does Semi Transparent last longer or have more staying power than semi solid? Can't decide between the two cedar products. Our deck is almost 20 years old and has full sun exposure and regular heavy winter snows. The semi-solid would give a little better UV protection. That is the only difference. i have a 2 wide steps (about 10 ft wide) with a landing at the top (about 8X5) made from IPE. I have let it gray over the last few years. I have cleaned the wood but there are still some spots where the old stain is visible (mostly on the vertical posts). The hand rails and steps/landing are grayed. Can I use a stain to give it color or do I need to do something else before staining it. If I have splintered wood and cracks, do I need to use a wood filler first? If so what kind? Also I have sanded it the best I can but there are still gaps or deep crevices from removing deck over. I have pressure washed it also. Wood filler will not work on exterior wood. Nothing you can do to fill this and best to just leave the cracks alone. Go ahead and stain. Any color you like will work for a fence. Does not matter. Most use semi-transparent colors.